The Brides' Have Spoken With Their Pocketbook. 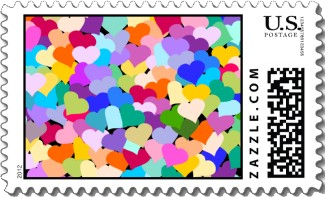 These Are the Top 10 Most Popular Wedding Postage Stamps. 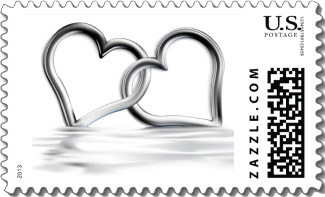 Based on recent sales, these customized stamps are the most popular wedding stamps. 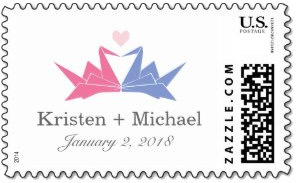 Like all NotThePostOffice.com custom stamps, you can create a personalized stamp for your wedding invitations by including your names, date or photo. Use this extensive collection of custom colorful wedding stamps to create your own personalized wedding stamp. Available in three sizes and all denominations. His and her's pastel origami cranes form a heart above your names and date. An ancient Japanese tradition of folding 1,000 cranes for a thousand years of happiness. Japanese wedding stamp. Your initials carved into the side of the log with your first names below. Done in soft colorful pastels. Very sweet wedding invitation stamp. This silver love wedding invitation stamp will to go with any color set for an elegant look. 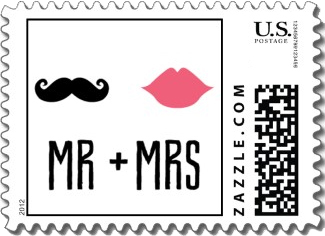 A fun wedding stamp with a black mustache and pink lips above "MR + MRS". Available in the inexpensive small size only. Simple and fun. 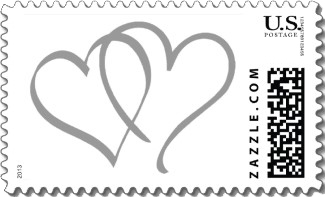 Two stylized and interlocking silver hearts against a white background make this a chic wedding stamp for all your wedding mailings. You can easily change the date, add your names and even alter the Save The date text. Soft gray fonts contrast nicely with the white background and the arrow through the pink heart. Very nice, indeed. 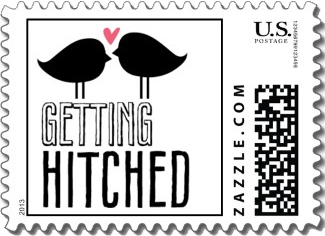 A very cute wedding stamp in black and white with the text "Getting Hitched" below and two love birds in silhouette above with a small pink heart between them. Works well with any wedding colors. 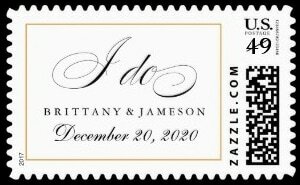 Simple and appealing personalized wedding stamp with "I Do" in a stylized script font and your names below in a sharp traditional font and then your date. 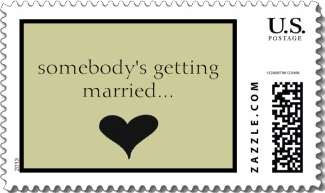 A fun wedding postage stamp that builds the excitement until your invitation is opened. Neutral colors with the text "somebody's getting married . . ." above a stylized heart. A formal save the date wedding stamp with a black background and white text. "Save" and Date" use an engravers front and "The" has a swirly script font. Available in multiple sizes. Very chic. 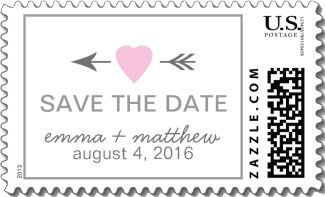 This fun save the date wedding stamp is a stark black and white with a stylized pink heart in the middle. Attention grabbing. Available in the less expensive small size only. A bright and vivid wedding stamp that works with all colors and wedding correspondence. 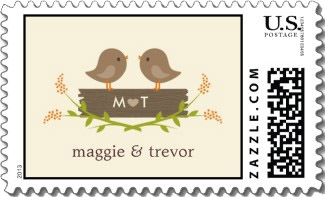 These customized stamps are currently the most popular wedding stamps. You can create a personalized stamp for your wedding invitations by including your names, date or photo. Discover an extensive collection of custom colorful wedding stamps and create your own personalized wedding stamps.